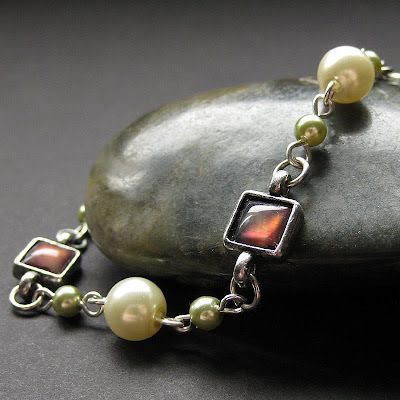 A beautiful bracelet of green and cream pearl beads combine with metal squares with iridescent purple inlay combine to create a light-weight vineyard inspired style you're sure to love to wear over and over again. This handcrafted pearl bracelet is the perfect accent piece, whether you want to dress up a casual outfit or dress to impress with an elegant ensemble. Bracelet measures 8.6" (22 cm) in length including clasp.